​In 1971, at the annual FASEB meeting, flyers were posted inviting women scientists to a champagne mixer and meeting to encourage the exchange of ideas and solutions to overcoming job discrimination, lower pay, and professional isolation. Those 27 women who took the initiative to make science a better place for women founded the Association for Women in Science (AWIS), today's premiere leadership organization advocating for the interests of women in science and technology. For nearly 40 years, the Association for Women in Science has fought for equity and career advancement for women – from the bench to the board room. We unite women through our nationwide network of chapters and partnerships with aligned professional organizations -- all of whom are committed to the advancement of women's leadership in STEM. AWIS-NCC is the Northern California Chapters of the Association for Women in Science. Currently, there are four chapters in Northern California: East Bay Chapter, San Francisco Chapter, Sacramento Valley Chapter and Palo Alto Chapter. The AWIS-NCC committee is comprised of the NCC representative from each of the four chapters, the NCC chairperson, the NCC fundraising chair and the treasurer. Other chapter board members may be included as desired. The AWIS-NCC committee serves the members of AWIS in this Bay Area region through representation on regional issues and through the organization of fundraising, an annual awards banquet (see Awards tab), workshops and conferences of interest to all AWIS members and the general public. 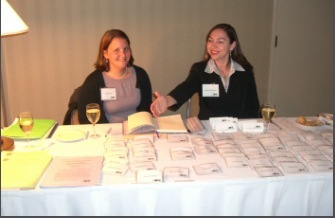 The AWIS-NCC committee is the official fundraising arm for the Northern California chapters of AWIS. All corporate donations should be sent directly to AWIS-NCC. Corporate funds raised are distributed by mutual consent among the chapters as requested for local projects such as outreach, mentoring, awards, picnic and local scholarships. Corporate funds are not used for chapter operating expenses. It is governed as 501(c)3 separate from the chapters under National AWIS affiliation. Those interested in supporting our mission are invited to provide refreshments at chapter meetings in exchange for presenting demonstrations of their products and distribution of promo materials. Please contact each chapter directly, if you would like to do so. National AWIS conducts separate fundraising at the national level. Please see AWIS.org for advocacy, membership and partnership information. NCC-AWIS Committee - AWIS-NCC committee and chapter boards consists of all volunteers. Serving on a chapter board, programs committee, mentoring committee or taking charge of a project is a great way to develop leadership and networking skills.